Ultimate is an exciting, non-contact team sport, played by thousands the world over. It mixes the best features of sports such as Soccer, Basketball, American Football and Netball into an elegantly simple yet fascinating and demanding game. To compete at the top level, Ultimate players require an unmatched degree of speed, stamina and agility. Yet the simplicity of the rules means it's easy and fun for newcomers to pick up. Ultimate is played between two teams of seven players on a large rectangular pitch. A line drawn across the pitch at either end creates two "endzones" (like in American Football). These are the goal-scoring areas. A goal is scored when a team completes a pass to a player standing (or more likely running) in the endzone they are attacking. Players cannot run with the disc. When you get the disc you must come to a stop and try to throw it to another player (a bit like netball). By passing from player to player, the offence attempts to work the disc up the pitch towards the endzone they are attacking. If the disc hits the ground or is intercepted or knocked down by the other team, then the opposition takes possession (a change of possession is called a "turnover", like American Football). Possession also changes if a receiver is outside the playing area when he or she catches it. The defending team attempts to stop the team with the disc from making progress upfield by marking them (as in soccer or basketball). The theory is that the offence won't want to pass to a player who is being marked closely, as it's likely to result in an interception. So it boils down to the offence players trying to get free of their markers to receive a pass, while the defence makes every effort to stay with them in the hope of forcing a turnover. Fouls and "Spirit of the Game"
Ultimate is essentially non-contact; any contact between players can be declared a foul. There's a variety of other minor violations, but that's the big one. 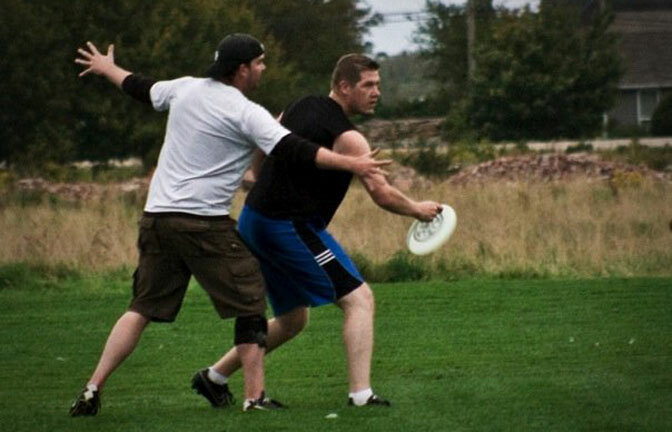 Ultimate is unique in that it is refereed by the players themselves, even at World Championship level, according to a code of conduct known as "the Spirit of the Game". This places the responsibility for fair play on the players themselves. In that respect, playing Ultimate is a completely different experience to playing other sports. And believe it or not, Ultimate's system of self-refereeing works. Beautifully. Dates Check the facebook page for days of play!